Antique - Crown Devon - S. Fieldings & Company, Covered Round Vegetable Bowl in the "Ranleigh" Pattern #D308. Circa 1917 to 1930, Priced per Individual Bowl w/Lid. Purchase one or more. Shipping Weight is per Bowl. 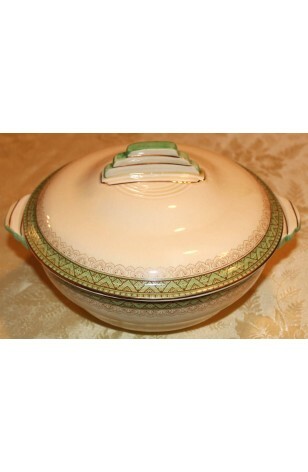 This is a great Covered Vegetable Bowl, w/Lid, made by Crown Devon - S. Fielding & Co. It is a Beige, with Green Verge and Green Band on Rim, with "V" Shaped Pattern inside the Band. Outside of the Green Band on Lip is Tan a Scroll Design, and on Rim Edge is a Dotted Pattern. These are used serving pieces, but are still in very great condition. Antique - Crown Devon - S. Fieldings & Company, Covered Round Vegetable Bowl in the "Ranleigh" Pattern #D308. Circa 1917 to 1930, Priced per individual Bowl w/Lid, Purchase one or more. Shipping Weight is per Bowl. This is a great Covered Vegetable Bowl, w/Lid, made by Crown Devon - S. Fielding & Co. It is a Beige, with Green Verge and Green Band on Rim, with "V" Shaped Pattern inside the Band. Outside of the Green Band on Lip is Tan a Scroll Design, and on Rim Edge is a Dotted Pattern. These are used serving pieces, but are still in Very Good Resale Condition, with no known defects.